Microsoft Excel has the "magic" RTD function that allows refreshing values from real-time data servers in Excel spreadsheets. The RTD function can be used in regular Microsoft Excel formulas. So you may use cell values as formula arguments and build powerful refreshable data sheets and models in a couple of minutes. YahooFinanceWatchList and YahooFinanceQuotes are data providers included in RealTimeToExcel. Getting real-time or delayed data from Yahoo! Finance, Google Finance, MSN Money, and other websites into Microsoft Excel. Getting real-time or delayed data from databases into Microsoft Excel. Yahoo! Finance, Google Finance, and MSN Money publish delayed quotes and financial data from 60 world's exchanges free of charge for non-commercial use. RealTimeToExcel is an intermediary that loads data from Yahoo! 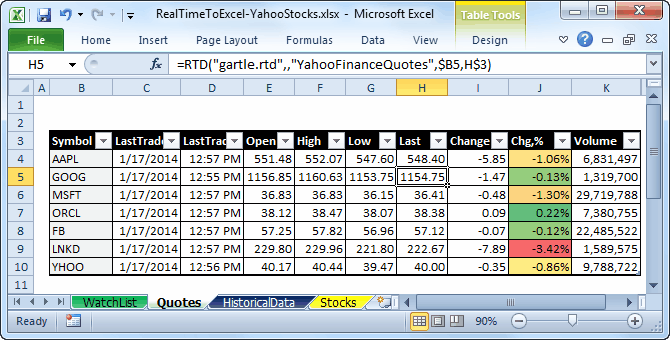 Finance, Google Finance, MSN Money, or other websites and refreshes data in Microsoft Excel. RealTimeToExcel also allows refreshing data from database tables in Excel in an easy way, without coding. You may also save loaded data into databases using the companion product, RealTimeToDB.